This is more than just a riding holiday! Ride amazing horses, cruise the Nile and retrace the steps of ancient Egypt. 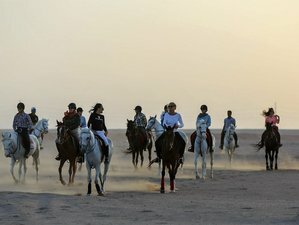 If you are looking for a holiday that’s action-packed and brimming with exciting days both in and out the saddle, this one is for you! You will have the opportunity to take in the glory of authentic Egyptian scenery as you enjoy trotting along the country of rich cultural treasures. A cruise along the Nile River will certainly complement this scenic trip. Don't miss out on this incredible chance to see Egypt the way it's meant to be seen! Tack type: Comfortable English leather GP, Endurance, Treeless, and Western are available. Horse breed: Arab and Arabian Cross. Spend five nights at the gorgeous Bedouin guest accommodation of the Villa Nile House in Luxor and two on the Nile cruise. If you add on the extension in Makadi Bay, you’ll head to the Harmony Makadi Bay Hotel with an optional upgrade available to the five-star luxury Sunrise Holidays Resort. Villa Nile House is a quirky charming guest house with outstanding service. Built in an oriental style with traditional materials like wood and cob, and comfortably decorated, it has two terraces on the roof with views of Luxor temple and Hatshepsut temple. When you enter the grounds, you will be delighted by the flower garden and you can enjoy the Bedouin corner to relax and drink a mint tea, or the traditional Egyptian Karkade. Each room is full of character and has air-conditioning, an LCD TV, and Wi-Fi access. Also, each has a private bathroom and an outside sitting area close to the room. At the back of the garden, the swimming pool, Jacuzzi, and hammam are waiting for you. From the patio, you will find the dining room. An open-air stair will lead you to the bedrooms and to the two terraces on the roof. Each of the charming bedrooms celebrates Luxor, find yourself staying in Hathor, Nefertiti, Kheops, Cleopatra, Nefertari, Akhenaton or Touthankamon to name a few. Situated on the southern crest of Makadi Bay and facing the Red Sea, this hotel and resort complex has over 800 m of beautiful private beach. The hotel has 4 swimming pools, including 3 pools, 1 of which is heated in winter, 1 saltwater pool and an open air jacuzzi, sun beds and beach towels are also available. With 2 bars and 5 restaurants, the Harmony Makadi Bay hotel is sure to offer dining arrangements to please even the most discerning of guests. Spa treatments such as massage can be booked at the onsite spa and wellness centre. Tales and Trails of Tutankhamun combines amazing riding and sightseeing by horseback plus a Nile cruise. Be enchanted by the story of how ninety years ago, Howard Carter discovered Tutankhamun’s mummy lying, surrounded by the grave goods, in a virtually intact tomb in the Valley of the Kings. Egyptology would never be the same again. Your adventures will look back at the tales of cemeteries and how they carry their own potent magic as well as how the dead kings were thought to have powerful spirits that might benefit others. After days of riding and sightseeing, your travels then take you along the Nile for the ultimate cruise to Aswan with its vibrant Nubian villages, full of hospitable locals. Aswan offers a much more laid-back lifestyle but is still pitted with historical sites such as the Temple of Philae, Kom Ombo, and Edfu. On this leg of the holiday, you cruise the Nile. It is wide and stunningly beautiful here, flowing gently down from Lake Nasser around dramatic black-granite boulders and palm-studded islands. On board, you will be treated to traditional Egyptian food, a Nubian folkloric show, and even an Egyptian galabaya party, which is definitely not to be missed. After your beautiful cruise, you get back in the saddle to continue your incredible equus trails through the land of the pharaohs. Travel day: Please take a direct flight to Luxor and then you will have a private transfer to your accommodation. You will be staying at your guesthouse on the Nile. Alternative direct flights to Hurghada are also available with a private transfer (approximately 3.5 hours). Your first morning riding through the West Bank villages to Banana Island is a fabulous introduction to both life here and your horses. Wave at the children running out of the houses to say hello as you ride in the shade of banana plants and through local villages and sugar cane fields. Zip through the sugar cane fields on your horse and enjoy the freedom only to be found on horseback. You will stop for fresh lemon juice before continuing your ride back for lunch along the Nile, where you can canter next to the grazing buffalo whilst enjoying views of the Nile to the left and the Valley of the Kings to the right. Your afternoon trip is to the incredible Habu Temple. The Mortuary Temple of Ramesses III at Medinet Habu is an important New Kingdom period structure in the West Bank of Luxor in Egypt. Aside from its size and architectural and artistic importance, the temple is probably best known as the source of inscribed reliefs depicting the advent and defeat of the Sea Peoples during the reign of Ramesses III. This ride is one of Ride Egypt’s favorite photo opportunities from horseback, taking you past the stunning Colossal of Memnon; two massive stone statues of the Pharaoh Amenhotep III, who reigned in Egypt during Dynasty XVIII. Habu Temple itself is one of the most well preserved temples today. You will arrive by horseback and be met by your guide. While the horses wait outside, you will be transported back in time to the times of kings, queens, and Ramses, the most powerful pharaoh of them all. Your ride back is at sunset and the ride home usually takes you behind the sugar cane fields and their amazing dirt tracks which is perfect for a really long gallop and a chance to really see your horses fly. This is the ultimate trail ride through the land of the pharaohs. Your morning takes you into the countryside of Luxor where the lush green sugar cane fields are perfect for a good canter and the scenery is spectacular. Watch the farmers working in their fields just as their ancestors did using old traditions. In the mid-morning, you can prepare to be amazed as your sure-footed horses will take you behind the Valley of the Kings and to the top of Mount Thebes so you can see panoramic views of Luxor. Your trail continues west to the highest of the peaks in the Theban range of hills. This is Qurn, which can be translated into “horn” or “forehead” in Arabic. Here, there are a number of unfinished tombs. Sixty-two numbered tombs are known to Egyptologists. This was the final resting place of many of the New Kingdom rulers. After a fabulous morning, it’s time for some food and cold drinks (for you and the horses). Lunch is served at a local village where you will feast on local delights of barbeque pigeon, rice, and salad before riding back arriving mid-afternoon, with dinner to follow at your guest house. Today is West Bank non-riding day! The Valley of the Kings, also known as the Valley of the Gates of the Kings (Arabic: وادي ابواب الملوك‎ Wādī Abwāb al Mulūk), is a valley in Egypt where, for a period of nearly 500 years from the 16th to 11th century BC, rock-cut tombs were excavated for the pharaohs and powerful nobles of the New Kingdom (the Eighteenth to the Twentieth Dynasties of Ancient Egypt). Discover the painted corridors and chambers of three tombs at the Valley of the Kings; The Tomb of Tutankhamun, roam the stunning, cliff-cut terraces of the Temple of Hatshepsut, Egypt’s first female pharaoh. Visit the Valley of the Queens (Arabic: وادي الملكات‎ Wādī al Malekāt), a place in Egypt where wives of pharaohs were buried in ancient times. It was known as Ta-Set-Neferu, meaning ‘The Place of Beauty’. Located at the southern end of the Theban hillside, the Valley of the Queens contains at least 75 tombs that belonged to queens of the 19th and 20th dynasties as well as to other members of the royal families, including princesses and the Ramesside princesses. Your morning trip also takes you to the home of Howard Carter. This has to be Ride Egypt’s favourite piece of Luxor’s amazing history. It’s almost a hidden treasure, with very few tours visiting this fantastically preserved house where Howard Carter worked and lived during his time in Egypt until his departure in 1939. At the beginning of November 1922, Carter came upon the first of twelve steps of the entrance that led to the tomb of Tutankhamun. He quickly recovered the steps and sent a telegram to Carnarvon in England so they could open the tomb together. Inside the house, you can see the many objects that Carter once used in his daily life while he was working and living in Egypt. You can also see the photo lab he used, along with his cameras and other photography equipment. His original desk is still in the house, as is the library he kept and items relating to the excavation of King Tutankhamen’s Tomb, which are on display. It’s insane to see his office, where he slept, his darkroom for photos, and even original photos and newspaper cuttings. Hatshepsut Temple is also on this morning’s tour. Named for the Foremost of Noble Ladies, Queen Hatshepsut was the fifth pharaoh of the 18th dynasty of ancient Egypt and the daughter of King Thutmose I. She established the first world trade network and her temple is considered one of the most important temples of ancient times. There are many stories of how she transformed herself from regent to pharaoh and how she began having herself depicted in the traditional king’s kilt and crown, along with a fake beard and male body. This was not an attempt to trick people into thinking she was male; rather, since there were no words or images to portray a woman with this status, it was a way of asserting her authority. Under Hatshepsut’s reign, Egypt prospered. After an action-packed morning, you will stop for lunch along the River Nile before visiting Valley of the Queens, where wives and sons of pharaohs were buried. There are more than 90 known tombs, usually consisting of an entrance passage, a few short halls, and a sarcophagus chamber. The earliest may be that of Sitre, wife of Ramses I. The most notable are those of Nefertiti, the favourite Queen of Ramses II, the tombs of Princes Amonhirkhopsef, Khaemwese and Sethirkhopsef, and of a Ramesside Queen called Titi. You proceed to visit the Valley of the Workers at Deir el-Medina, also known as Set Maat, ‘The Place of Truth’. It was home to the artisans and workmen responsible for constructing the royal tombs in the Valley of the Kings during the 18th, 19th and 20th dynasties of the New Kingdom period (1550-1080 BC). You will enjoy exploring the ruins of the settlement of the village, the Ptolemaic temple, dedicated to the goddesses Hathor and Maat consisting of a small building within a mud-brick enclosure wall and two of the finest decorated tombs of Sennedjem, Inherkau, and the Tomb of Peshedu, a 19th-dynasty servant in the Place of Truth. Four of the tombs are open for viewing. After a fabulous day of sightseeing, it’s time for some VIP luxury as you board your cruise ship in time for afternoon tea as you sail towards Aswan with the beautiful scenery of the Nile valley. Once you arrive at Esna, you cross the lock to be in a higher level of water which may well be the best view during your travels of Egypt. You will enjoy dinner, entertainment, and overnight on board (Edfu). Today is the Nile trip. Wake-up call with breakfast on board while you cruise the Nile in Edfu. Visit Edfu temple by horse-drawn carriage (the well-preserved temple that is dedicated to god Horus - falcon-headed god), then back to the Nile cruise. This is a great chance to see the locals and their city. Sail onwards to Kom Ombo with lunch onboard. Once you arrive at Kom Ombo, a short 10-minute walk on the eastern edge of the Nile brings you to visit the temple of Kom Ombo which houses a room of crocodile mummies. After that, it’s back to the cruise, sailing to Aswan with afternoon tea on the sun deck. Dinner is also on board, along with entertainment and your overnight stay. Today, you will visit Aswan. Enjoy breakfast on board and disembarkation. A day of sightseeing in Aswan including Phillipe Temple and High Dam, after which you will return by car to Luxor for the evening. Your morning ride then takes you onto Ramesseum funerary temple of Ramses II (1279-13 BC). The temple, famous for its 57-foot (17-meter) seated statue of Ramses II (of which only fragments are left), was dedicated to the god Amon and the deceased king. The walls of the Ramesseum, which is only about half preserved, are decorated with reliefs, including scenes depicting the Battle of Kadesh, absolutely astonishing. After your morning ride, you will head back to your hotel for lunch and to relax. In the afternoon, you set off on horseback deep into the deserts that lay below Thebes Hills to visit the ancient Coptic Orthodox Church. This is a wonderful ride and you will visit a place where tourists very rarely visit. There will also be opportunities for plenty of long canters or gallops on the open ground. In the evening, you will have a delicious dinner of amazing Egyptian food, eaten while seated on cushions, before enjoying some shopping with your haggling skills at the ready as you hit the souks and barter with the local shopkeepers. Experience the dramatic history of ancient Thebes at the stunning Karnak Sound and Light Show in Luxor. The two-hour presentation narrates the achievements of great pharaohs as visitors walk through the complex of temples. Hear the story of their lives as the haunting music flows throughout this ancient city - an enchanting and supernatural experience with the magnificent ruins illuminated during the show. Today is a non-riding day. Your final day starts bright and early in the morning along the East Bank, including a visit to the infamous Temple of Karnak. This complex was originally dedicated to King Amun Ra, his wife Mut and son Khons. Later, around 30 additional kings added their own touches to the complex. The site is vast, covering nearly one mile by two miles in area with more than 20 temples in all. What makes the Karnak Temple complex special is that it includes several of the finest examples of ancient Egyptian design and architecture, such as the Hypostyle Hall, one of the world’s great architectural achievements of all time and the Temple of Amun, a spectacular forest of giant papyrus-shaped columns. Karnak Temple is the most visited site of ancient Egypt after the Great Pyramids of Giza. You will marvel at Luxor Temple, built by Amenhotep III from Nubian sandstone, walk through the Avenue of the Sphinx before finishing at the Mummification Museum. Although small, the Mummification Museum is an archaeological museum in Luxor, Upper Egypt. It is dedicated to the art of ancient Egyptian mummification and most definitely worth visiting. This is all followed by lunch and check out. For those with a Red Sea extension booked, you will drive to the Red Sea after lunch, arriving in time for cocktails and dinner. Optional extra: Sunrise balloon tour - the perfect finale! See the sun rise over some of Egypt’s most famous ancient monuments on this exhilarating hot air Luxor balloon ride. After early morning pickup, enjoy the thrilling bird’s eye views as the sunlight illuminates the temples and mountains below. Gaze down over Karnak, Queen Hatshepsut’s Temple and other monuments, and absorb the peaceful dawn. It is the perfect end and farewell to your week retracing the steps of the pharaohs. On the fourth day, you will explore the West Bank to visit the Valley of the Kings, Valley of the Queens, Valley of the Workers, and the home of Howard Carter. Explore the East Bank and visit Temple of Karnak, Luxor Temple, Avenue of the Sphinx, and Mummification Museum. This horseback riding vacation takes place in Egypt, exploring the West and East Banks of the Nile River. Breakfasts, lunches, and dinner are provided on riding holidays. Soft drinks and alcohol are payable locally. On board the Nile cruise, you will enjoy Egyptian food. Complimentary water bottles on riding trips are available. Airport: Luxor International Airport Airport transfer included: Luxor International Airport No additional charges. You can request this in the next step. Single person supplement is available on request.